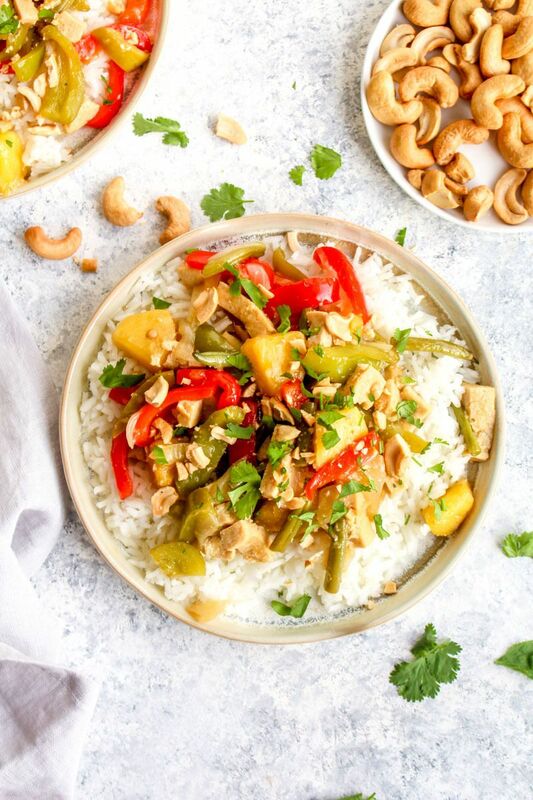 Tofu Pineapple Stir Fry is on your table in 30 minutes! This speedy weeknight dinner is full of veggies, sweet pineapple, and a bright ginger sauce. Whisk all of the dressing ingredients together and transfer to a small freezer friendly lidded container. Set aside. Place all the stir fry ingredients into a large freezer zip top bag. Add in the lidded container with the sauce and zip shut. Store in the freezer until you are ready to get cooking. Remove the sauce from the bag and submerge it in hot water for 1 minute to help it pop out of the container. Add all the contents of the bag and the sauce to a large skillet. Cover and cook over medium heat until the vegetables break apart and are no longer one large vegetable ice cube, about 20-25 minutes. Remove the lid and continue to cook until the sauce is reduced, about 5-10 minutes. Serve over rice.